There’s no denying that Pennsylvania is one of the most beautiful states in America. From majestic mountains to breathtaking scenery, Pennsylvania is truly a great place to live. Some of the state’s greatest sightseeing points happen to be natural attractions. Pennsylvania is home to countless state parks and outdoor areas, making it the perfect place to live or visit for nature lovers. Whether you’re a native or just passing through, here are some of the best natural attractions in Pennsylvania. Nestled in the little town of Benton, Pennsylvania, Ricketts Glen State Park is one of the most visited natural attractions in the state. The park, which features 22 named waterfalls on more than 13,000 acres of land, continues to be a popular nature spot for Pennsylvanians. In fact, the park is so large that it takes up land in Luzerne, Sullivan, and Columbia counties. Visitors can hike the Falls Trail alongside the park’s magnificent waterfalls or relax at the beach by the sparkling waters of Lake Jean. There are endless things to do at Ricketts Glen, making it the perfect place to spend the weekend! Hickory Run State Park, located in White Haven, Pennsylvania, is another popular state attraction. 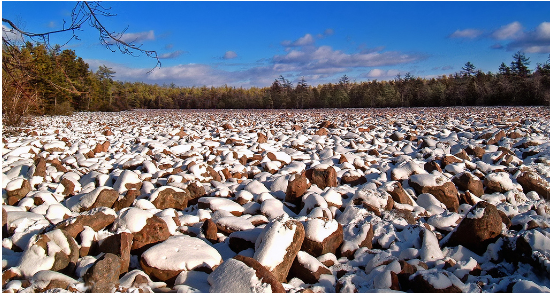 One of the biggest draws for the park is Boulder Field, a 400 x 1,800-foot field of large boulders that seem to go on for miles. While not for the faint of heart, Boulder Field is the perfect attraction for thrill seekers looking for a unique adventure. Hickory Run State Park also features a beach at the park’s Sand Spring Lake, a popular stopping point during the warmer months. The beach is especially popular on weekends, and many people choose to spend the entire day lounging by the water. Hickory Run State Park continues to be one of the most popular points of interest in Pennsylvania, so be sure to stop by and see what all the hype is about! Known as “the Niagara of Pennsylvania”, Bushkill Falls is a series of eight privately-owned waterfalls nestled in the Pocono Mountains. While The Poconos was once a wildly popular vacation destination for couples, the area went through a serious transformation with the opening of several resorts and water parks in recent years. With rebranding efforts, such as hiring an SEO consultant and revamping the appeal of The Poconos. Bushkill Falls is one of the most visited places in The Poconos, and the park’s admission fee only adds to the hype surrounding it. Visitors can choose to hike, fish, boat, and even mine for gemstones at the park. Bushkill Falls is the perfect place to visit with the family, as there is something for people of all ages to enjoy! Ricketts Glen, Hickory Run, and Bushkill Falls are just a few of the many natural attractions in Pennsylvania, and there is never a shortage of things to do and places to see. Be sure to check out these attractions and everything else the great state of Pennsylvania has to offer!